This cake went along with my son's present. We took him to see the Harlem Globetrotters for his 13th birthday. It was great and he had a blast. 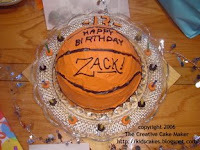 I had even considered making the cake look like an official Globetrotters ball. Once again, I pulled out my Betty Crocker Bake N' Fill dome cake pan. This time I decided to fill it...with cookies and cream pudding! I colored some icing orange (obviously) and covered the whole thing. Then, I used the tip of a butter knife to make the grooves in the "ball" where the lines would go. That way, If I messed up the placement, I could just smooth out the orange icing and start all over again. The grooves made it easier to keep the "lines" in the right spot. Once again, I didn't know what to do with the candles, so I made dots of icing all around the cake and placed candles in them. It made blowing out the candles much more interesting.